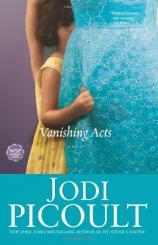 Readers familiar with Jodi Picoult's earlier novels, such as MY SISTER'S KEEPER, SALEM FALLS and the wonderful THE PACT, already know what first-time readers picking up VANISHING ACTS are soon to find out: few writers in contemporary fiction create characters more achingly real than Jodi Picoult. Where Picoult's talents really shine, however, is in her ability to create often dizzyingly complex plot twists for these same characters --- resulting in a novel that is nearly impossible to put down until the last page is turned. Once again, Picoult strikes gold with her latest offering, VANISHING ACTS. The novel centers on Cordelia (Delia) Hopkins, a mother raising her young daughter Sophie and working in professional search-and-rescue with her bloodhound, Greta, in New Hampshire. Raised by her widowed father Andrew, with whom she shares a close relationship, Delia is preparing for her upcoming wedding to Sophie's father and her childhood sweetheart, Eric. One day, after a successful search-and-rescue of a lost little girl, Delia returns home to a knock on the door from a police officer who brings news that will turn her life completely upside down and make her question everything she thought she knew about her own family and her identity. Picoult weaves her story together by alternating chapters in varying characters' voices, allowing the reader to intimately connect with each of them and develop layers of understanding that wouldn't be possible in a single-person voice. And even as the characters change, the locations do too --- from the present to the past, from a quiet New Hampshire village to the deserts of New Mexico, from courtroom to jail yard (Picoult's prison sequences are particularly well-written.) There are layers upon layers of plotlines here --- beyond the prison storyline, a classic love triangle blooms, further entangling the reader into the novel and promising late nights until the last chapter is read. As with her previous novels, Picoult doesn't shy away from controversial and emotional subject matter --- in this novel, parental abduction, alcoholism, drugs and prison life, even suicide, are all laid out for review. Picoult doesn't feel the need to tie everything up neatly, either --- as with real life, the answers simply aren't always there to be found. At its heart, VANISHING ACTS explores the definition of self, of our definitions of morality and of family. What elements make us who we are? What does it mean to be a parent? What does it mean to be a couple? What is the difference between right and wrong --- and are wrong actions ever justified? Rather than providing simplistic answers, Picoult does more than enough simply by raising more questions for her characters to explore --- and the reader with them. With any luck, she'll keep asking questions for many, many years to come.